Paris Saint-Germain will be without Neymar against Real Madrid but Kylian Mbappe is back in training after missing the win over Troyes. Kylian Mbappe has handed Paris Saint-Germain a fitness boost ahead of Tuesday's Champions League showdown with Real Madrid. The Ligue 1 leaders' hopes of turning around a 3-1 first-leg deficit in the last-16 tie were dealt a hammer blow when Neymar suffered a broken metatarsal in the 3-0 Ligue 1 win over Marseille a week ago. To compound matters, Mbappe sustained an ankle injury against the same opponents in the Coupe de France but the teenage France forward is ready to face Zinedine Zidane's European champions. Speaking at a pre-match news conference, PSG head coach Unai Emery said: " Kylian Mbappe trained normally with the squad yesterday. The only player, apart from Neymar, who did not, was Javier Pastore. "Normally, all players will be ready for tomorrow's match against Madrid, except Neymar." This near-clean bill of health means Thiago Motta and Lassana Diarra offer more experienced options in the holding midfield role, where Argentine youngster Giovani Lo Celso struggled at times during the defeat at the Santiago Bernabeu. 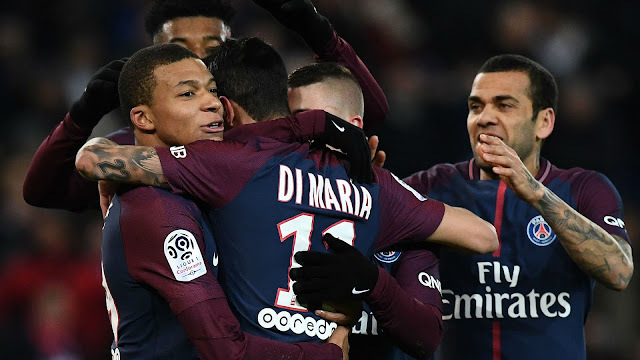 Thiago Silva, Marquinhos and Presnel Kimpembe will also contest the two centre-back slots once more after Emery controversially left club captain Silva on the bench in Madrid. "Both Lassana Diarra and Thiago Motta possess the experience for this sort of big European match," he said. "All three central defenders are ready to play against Real Madrid. We will see after the final training session. "The 11 starters and the substitutes will all be important against Real. Everybody will need to chip in." Although their late collapse in the Spanish capital makes PSG the underdogs, a 4-0 win over Barcelona at this stage on home turf last season gives cause for optimism and Emery called on the Parc des Princes faithful to greet their illustrious opponents with a cacophony of noise. "It is a very important moment of the season, a unique moment for all the PSG supporters and all of France. The Champions League is a major objective for the club," he added. "This match is different. Above all, it is in Paris. We will be 12 with the support of the fans. "We need to stay united on the inside and also show that from the outside. We want unity with the PSG fans. "It is the first time that we have played an important Champions League return leg at the Parc des Princes. This is something different."